Note towel on the back of Melanie’s chair. Could that have come from a box of Duz? 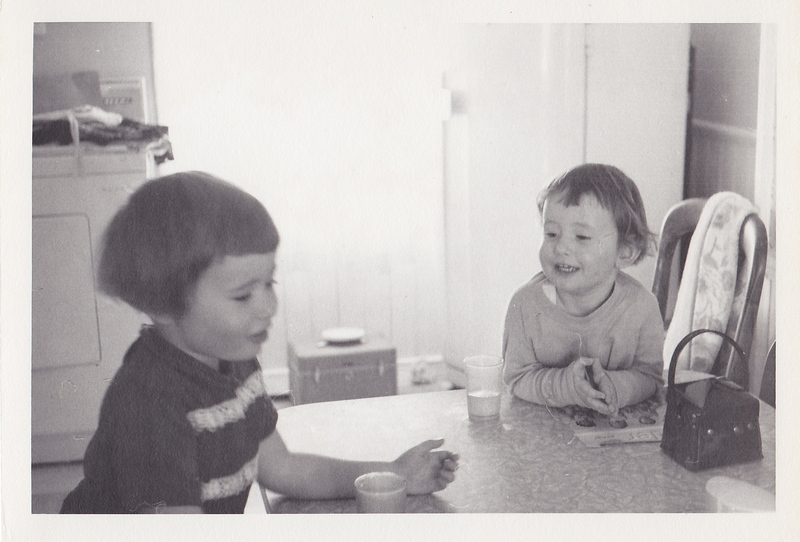 In studying the old photo in yesterday’s post of my sister and me as little kids at the Manse – another, similar one is at right; note bowl haircuts – I think I recognized something that made me nostalgic. Draped over the back of the chair that Melanie is sitting in is what looks like a towel. And I think it may have been a towel that came out of a box of laundry detergent. Only those of you of a certain age will have a clue what I’m talking about. But yes, back in the 1960s some products were marketed not necessarily for their innate virtues, but because they came with a free thing inside, and what I remember most are the towels in the laundry detergent. It seems to me the detergent in question was Duz (what a great name! ), but my extensive (okay, not so much) online research has turned up only drinking glasses in Duz. (You can see a goofy ad for the glasses-in-the-Duz here – and recall the days when TV ads were a full 60 seconds long. It goes on forever!) Does anyone have any light to shed on this extremely important matter? What detergent did those towels come out of? Anyway, whatever kind of detergent it was, we had a lot of those towels. When your family is that of an ill-paid country minister and there are six mouths to feed, free stuff is pretty attractive. And you know, I rather think some of those towels might still be in my family’s possession, being used up at the family farm in Haliburton County. What else came free in boxes and bags of unrelated material – does anyone remember? Over the years I’ve collected bits and bobs of Anchor Hocking Bubble ware at collectibles stores and yard sales, because I am a hopeless nostalgic (as you will have long ago guessed) and they remind me of my grandmother Sedgwick, who had several of those pieces. My bubble plates are at the Manse, and when my mum saw them at Christmas (we served the Christmas pudding on them) she had a flashback to them arriving in those giant bags of puffed wheat that everybody (right?) used to buy. Again, I have not been able to find any confirmation of this, but it would explain why my grandmother’s collection was a bit of an odd assortment – and why those Bubble pieces are so incredibly common. Because how could you have a houseful of kids (as almost everyone did in those Baby-Boom days) and not buy giant bags of puffed wheat? (The subject of a joke or two by my cousin Nancy’s husband, comedian Denis Grignon, who grew up in another of those big Baby-Boom families.) And so what if puffed wheat was the most nutrition-free food in the history of the world? It was very cheap, and it filled the kids’ breakfast bowls. And if a useful towel or a dinner plate or a dessert bowl was to be found inside, well – bonus! This entry was posted in Uncategorized and tagged Anchor Hocking Bubble ware, big bags of puffed wheat, Bubble ware, Denis, Duz detergent, glasses in detergent boxes, Grandma, Melanie, towels in detergent boxes by Katherine Sedgwick. Bookmark the permalink. Thank you for that link, Brenda! The writer reminded me about how the smaller boxes of detergent (which he/she also thinks was Duz) had a washcloth in them, while the bigger ones had towels. And another entry mentions bread trucks, and before long I am sure that our old “bread man” will be the subject of a Meanwhile, at the Manse post. Oh yes, I certainly do remember Silverwood’s, Doug. Weren’t they based in Peterborough? I remember their cute pale-yellow trucks. I remember the Breeze laundry soap with the towels in them!! You know, that is totally ringing a bell, Tammy. Thanks for the (distant) towels-in-detergent-boxes memories! I have a bubble plate and often serve a scoop of yogurt on it for kitty. Speaking of finding things in our packages I use to love opening the red rose tea and see what bird I would find. Thanks for letting me know where my little plate came from. Oh yes, the Red Rose tea and the birds! Now that you mention it, I remember my grandfather J.A.S. Keay (a birdwatcher and bird-lover) had a whole collection of those on a specially designated shelf at the cottage he and my grandmother had at Wilberforce, Ont. That’s a happy memory, mk – thank you! There were so many little Red Rose figurines–I loved them! Have you noticed them in antique shops when you’re poking around? Funny to think our little treasures (now chipped from much playing-with by at least two generations) are now collectors’ items! Oh yes, I’ve seen them in the collectibles shops! It seems to me that one version I’ve spotted is a series of little cottages … or maybe I’m mixing those up with the teapots that Brenda mentioned in an earlier comment. Did the teapots look like cottages, I wonder? Oh my goodness, Brenda, than you for that link. It’s all coming back to me now! Our Mom did not use Duz, but my friend’s Mom did…they got striped dishtowels in the box, and if they purchased a smaller box of Duz they got a facecloth! I don’t remember getting any dishes in cereal boxes, though. What a great memory, Katherine! Thank you ever so much for the towels-in-the-Duz confirmation, Eloise! When my kids were young (about 30 years ago), I used to get a kick out of collecting all those sweet little whimsical teapots in Red Rose tea boxes. How did I miss out on the teapots? I remember the birds, but not the teapots! Thank you, Brenda! That’s very cool – the other night after I did my post, Raymond and I were talking about prizes and extras that came in boxes, and I mentioned the stuff in cereal boxes (though for the life of me I can’t remember what any of it was). He said he didn’t recall that, growing up down in Massachusetts, though maybe they just weren’t a dry-cereal family. (What?? No giant bags of puffed wheat??) I will listen in on that program for sure. Breez detergent came with a towel inside! You are absolutely right, Olin! I just looked up Breeze and discovered that in the 1960s Breeze had a “free towel with every box” offer. What I can’t remember was whether Breeze (towel or no towel) was available in Canada. Breeze was totally available in Canada and very strong in Quebec. A few days ago I came across some towels in a vintage shop that I was pretty sure originated in a detergent box. Was sorely tempted to snap them up, but I resisted. Roy, would you recognize any of the Duz towel patterns after these long years? Somehow I suspect you were considerably more involved in the marketing of the product than in overseeing the towels’ floral designs! There is only one design that I remember because we had to market research it in suburban Montreal. It was all so strict in those days. We went on foot with a market research supervisor. We’d have to count so many houses and then knock on the door of a certain house. I could speak pretty good French in those days so I could speak to the housewives in their own language. The women were all so friendly and they all wanted to invite us in for coffee. LOL. But we had to work and you can only drink so much coffee anyway. The pattern which we researched and which was chosen had a white background with big intertwined circles made up of little rose buds. A good clue to a free towel is how thin they were. Think of a piece of Terry cloth that has been washed 100 times. Now how is that for proving that I am not senile, yet? That was in 1967, 51 years ago and I am now 77. They have a lot of great 1960s songs on YouTube. I was a big fan of Judy Collins and her song Both Sides Now. I read Bill and Hillary Clinton were big fans too and that she sang that song at Bill’s first inauguration. It’s on You Tube. I swear to goodness, Roy, you should write a memoir – your stories of the midcentury advertising business are amazing! And yes, now that you mention it, I totally remember how thin those detergent-box towels were. They still dried a lot of little kids after their Saturday-night baths, though! At least my memory is sharp even though I seem to have new aches and pains on a daily basis. Told you I am now 77 so the towel episode was in 1967, 51 years ago!! The towel pattern that did not win in the market research was designed by the in-house designer for the company in Toronto which screen printed the Canadian towels. It was called Cutler Designs. Their design was a single, big yellow rose surrounded by blue but on a white background. Pretty ugly. I changed jobs about year later and went to work at a prestigeous management consulting firm. One of my first projects was for a company in Chicago that made school uniforms. Again I had to do interviews in Quebec and in French. This time I interviewed a bunch of lovely nuns. The nuns said they were discontinuing the wearing of uniforms much to the dismay of my client in Chicago who had hoped to expand into Quebec. I am very surprised by that! I saw many, many students wearing school uniforms during my years in Montreal from the late ’90s to 2013. Tracy, you and I obviously have a lot in common! Especially treasuring the – well, the treasures that our mothers acquired through sometimes humble means (detergent boxes, green stamps, store promotions) back in our childhood. How lucky you are to have those special dishes of your mom’s! My mother was English and she would only drink Red Rose tea. I have it for breakfast every morning. Roy, was it Red Rose that had lots of figurines (birds, animals, etc.) in the boxes? Yes, it was and I think they still do…very small ones. Well! I may have to pick up a box of Red Rose tea one of these times! Remember the bricks the loose-leaf Red Rose used to come in? I am in possession of one tea spoon, I swear it came from soap giveaways, but maybe grocery store. It has 3 leaves on it, on the back says “stainless steel and in cursive so cursive I can’t rad it, it say MWC?G?B/? Growing up in the 50s, we had little money, so I know my mother acquired this set through soap boxes or at the grocery store – we mostly shopped Krogers in KC area. 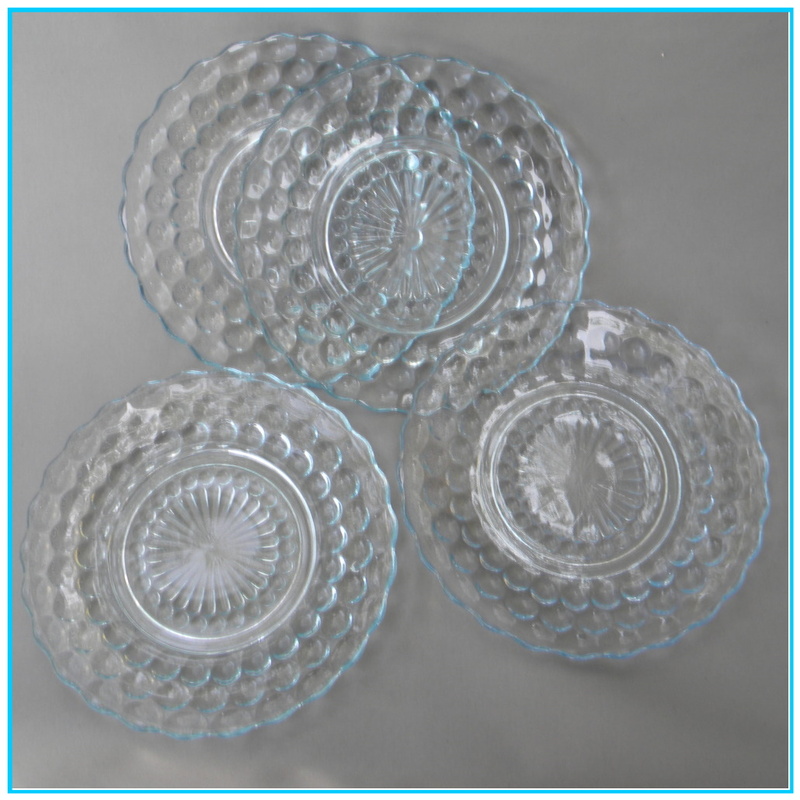 We also had the wheat dishes & I smile when I see them at Flea Markets & collectible shops. But I cannot find anything one this cutlery. Anyone remember them? I really want to know. Hey Barbara, I’m afraid I can’t help you with your teaspoon query – but isn’t it something, all the cool things our thrifty mums used to get from detergent boxes and whatnot – and actually use? And that we still have? The free towels came in Unilever’s “Breeze” detergent. I remember they came in a stripe and a floral. We had a family of 9 and it was exciting to open those boxes of Breeze, Oxydol, Duz, and others for the nice, new towels and glassware from Anchor Hocking. My mom has passed since (2012) & my dad is near 90 yrs old in a nursing home but boy, this subject sure brings back memories. Thanks for your posting! I am a child of the ’50’s..and remember gifts in the puffed wheat bags..soap boxes, etc. It was a wonderful lift for a 5- kid family that didn’t have a lot of spare cash! I have a green bowl ..Fireking ware… that I think I saw coming out of a box as a bonus. We got towels, all rolled up small; birds in tea; later when my kids were young there were action figures in puffed wheat which were little pieces of art!! What a nice memory to stir up!! Oh, Marilyn, you paint such a familiar and happy picture! Stuff in the puffed wheat, stuff in the deterg boxes… but wow, the idea that Fire-King ware (which I am now an amateur collector of, and it tends to cost a pretty penny) was among the free-in-the-box items – interesting! And I so remember the porcelain birds that were in the tea; my grandparents had a whole pretty shelf displaying them at their cottage. Simpler and (dare I say it) happier times! I only have 1 small green bowl, but when I looked them up online I found lots of people selling them..saucers,cups ,etc. I also remember the peach coloured mugs,some with bumps on them. I have some Blue Mountain ware, mostly the Country Charm, which I found at Goodwill or Valu Village.Don’t think I’ll ever make money on them. But I do like them. I tried to remember other stuff we got in puffed wheat, but my memory is vague. I do remember my disappointment when they stopped putting bonus gifts in . Did you ever buy Cracker Jack with the prizes inside? I can remember getting one earring once! My aunt would buy the boxes for us 4 kids..late ’40’s..and get first crack at the prizes. if she liked the prize she kept it. I don’t think that happened too often. Never did like the nuts in the box, only the popcorn! We used an icebox when I was young and lived in Norwood(St. Boniface) Man. To save money we went to the icehouse not too far away, put a quarter in a slot and a rumbling noise started somewhere in the large mysterious building. I was afraid,maybe quite young. When we got 2 blocks of ice Dad covered them with canvas and we hauled them home in the wagon that had been bought for my younger brother and sister.I think the ice was cut on the Red River. Marilyn, your stories and memories are wonderful! I can so relate when it comes to not liking the nuts in Cracker Jack (while loving the supersweet popcorn and the dopey prizes) – and Blue Mountain, and peach-coloured Fire-King! (I know what you mean by the ones with bumps on them; in my view, that’s when Fire-King went south.) And the icehouse, wow – I am just a little too young to remember iceboxes and icehouses, but you paint such a great picture of that – thank you! Also – nice to meet someone who is from the same place (St. Boniface) as one of my literary heroes, Gabrielle Roy. I was surprised and pleased that you mentioned Gabrielle Roy; she was also one of my heroes!! When I read her story of teaching in a remote place, I could relate, having moved way up north to teach in a one-room school. But reading her stories of growing up I thought how wonderful that she could evoke childhood feelings and thoughts so well. I used to think maybe she wandered the streets I played in (many years later) but looking on the map I realiized we lived fairly far from her neighbourhood. About half of the people in our neighbourhood were French and some didn’t mingle too much with English speakers, but I had a few friends who spoke French. We were near 3 rivers there : the Red, Seine ,and Assiniboine. Of course, we were threatened by the flood when I was 6 and had to evacuate. We left for the East when I was 9, so the memories I have come from before that move. Do you go to yard sales looking for collectibles? I don’t have any knowledge about any certain items except the Blue Mt. ware so I have mostly given up trying to find anything valuable. I guess a lot of people have an eye out for special items that they want to complete their collections. Oh yes, I sure do go to yard sales looking for collectibles, Marilyn – do I ever! And of course I also manage to pick up stuff that, once I’ve got it home, tends to fall more into the “junk” category. But hey, it’s great fun! I do have several pieces of Blue Mountain ware, which reminds me of my childhood here at the Manse when everyone seemed to have lots of the stuff. Hey, is the Gabrielle Roy novel you’re referring to La Petite Poule d’Eau (Where Nests the Water Hen in English)? That was one of the novels we studied in a course I did on her at university, and I loved it. You must have some amazing memories of your adventures teaching in the remote north! For some reason and I could be totally wrong, I thought the towels were in boxes of detergent called Trend. Hi Marcia! I kind of think those gifts-in-the-box – whether it be towels, or glasses, or whatever – were popular enough in the 1950s and ’60s that quite a few different brands probably tried it. Given the number of people who remember those towels (and in some cases still have them), it was a terrific sales and marketing gimmick! Thanks for the info and memory of this advertising ploy..I remember my aunt Jimmie speaking of Porter Wagner and soap with dishes in it! Hi Miranda! Yes indeed, Porter selling soap with towels in it – the good old days! Hi Donna! I have some vintage dishes with a wheat design on them too, but I don’t think they came from oatmeal; they are Fire-King (of which I am a bit of a collector, when I find the stuff at yard sales and whatnot). You can tell Fire-King by checking the underside of the plate, where you’ll find the logo. I don’t think Fire-King pieces were ever free giveaways with other products, but I could be totally wrong about that. Do any readers know? Oh yeah, I remember them, Barbara! There were some in at least one of the bedrooms when my family moved into the Manse back in the early ’60s – and I painfully recall how much trouble I got in when, as a four-year-old, I decided it would be a really good idea to tear them apart. Until your comment I’d never considered that they might have come in detergent or something, but that makes sense. I mean, would anyone actually pay money for plastic curtains? Thanks for opening up a new line of midcentury inquiry! I agree that it would seem very peculiar to pay for thise things but I suppose it is possible! I wonder if inventory records of a store like Kresge(?) or Woolworth’s or Montgomery Ward would list “plastic curtains. I’ll poke around a bit! Please let me know what you find out! This is most intriguing. Thanks for opening up a new line of midcentury inquiry! Have plastic (heavy insulated) dish set that came from Regina’s Silverwood Dairy YEARS ago & would like to know if worth anything??? Hi Corean! I’m afraid I don’t know what the value of that dish set would be, but you’ve aroused my curiosity with your reference to “Regina’s Silverwood Dairy.” There used to be a Silverwood’s dairy in Peterborough, Ont., a very well-known company in these parts, but I had no idea there were Silverwoods in other parts of Canada. I must look into this! Thanks, kim! Others have also said that the detergent in question was Breeze. Roy, I cannot even begin to tell you how great it was to get this comment from you. It’s Mad Men comes to the Manse! How amazing to hear from someone who was actually involved in the marketing and promotion of Duz and those free towels that are still kicking around some bathrooms all these years later. And what a story – it has everything! The premise that a midcentury housewife would love her free detergent-box towels so much that she would want to wear them; the ad-agency guy whose pitch fell flat in front of the important company executives (including you); the ad-agency guy’s temerity at presenting the same rejected concept, to success the second time; and that guy’s subsequent rise to fame and fortune. It’s got Don Draper all over it! You must have tons of great stories from those times – please feel free to share! And thank you so, so much for dropping by Meanwhile, at the Manse – what a thrill! Hi Tammy – as far as I (and readers/commenters here at Meanwhile, at the Manse) know, the two main detergent brands to include the free towels were Duz and Breeze – though it seems that other brands may have tried to get in on that great midcentury trend as well. Did Breeze have the towels? There were marbles in the cereal. I believe Cornflakes. Thanks again, Roy! I am happy to say that I have some of those drinking glasses that came in the Duz, thanks to a lucky find at an antique warehouse. Fifty years ago – yes, I know… yikes! Louanne, I defer to Roy (see comment below), who, as an ad-agency guy when all this towel-giveaway stuff was happening, is the absolute expert. It seems Breeze and Duz were the two main brands with the free towels inside. Now, as for marbles in Corn Flakes – there you have me stumped! Oh yes, Lou, I sure remember how exciting it was, as a family without a lot of money, to get free things! Hi, I was curios if anyone else remembered the towels in the soap boxes. I still have one I got out of a soap box, I believe in the early 70’s. It has a caricature of a woman and the words say “never underestimate the power of a woman.” Haha! Just thought I would also share a nostalgic item. Thanks! At some point they packed a drinking glass in the box instead of a towel. Those towels were ptetty thin as I recall. Yes, they were thin but the one I still have is still in good shape and still holding up. I thought on several occasions of getting rid of it but glad I didn’t as it reminds me of those days when it was cool to get something free in a soap box! Patti, you are a woman after my heart: for decades holding onto things because a) they’re still functional and b) they remind us of a different, possibly better, time. Like, the time when free towels came in detergent boxes! Hi Katherine, yes, I agree, those were better times indeed, in my opinion. I love the old days when items came free in soap boxes, cereal boxes and even when there was a real toy in the cracker jack box! Oh yes, the Cracker Jack toys! I loved those. The best was when they were magic tricks with which you could amaze and awe your siblings and friends. Thin – but free! That’s what mattered to families like mine. A genius marketing idea, if you ask me. Patti, the fact that you still have that detergent-box towel from the ’70s is – well, awesome! I think that somewhere among all my stuff (maybe in a gym bag, to tell you the truth) I still have a very faded flower-power detergent-box towel from the same era. I need to dig it up! I think the box of Ivory Snow maybe makes up for no towel in the Duz! Get this! I remember a box of detergent in 1965 or so that came a 45 record — The Detergents singing “Double Oh Seven”! It actually made the charts on CHUM according to the notes. Flipside was “Leader of the Laundromat”. Talk about a record made for a laundry box! My best guess was Tide. I think that’s what mom used to buy. Walt, this leaves me speechless. I mean – wow! So weird and so wonderful. One could not make this stuff up. Thank you! Does anyone remember the dishes with red roses in the center. Which box of laundry soap did that come in. Evelyne, I have to say I do not remember those particular surprised in the laundry soap, but I’m hoping some other readers might. Would they have been Fire-King dishes, I wonder? Thanks, Arlene! That sure sounds right. Towels came in boxes of Tide and I can remember green glass dessert didhrs coming in the cylinder shaped boxes of oatmeal. I still have several of the towels and dessert dishes. That is very interesting, Kathy; I believe you’re the first reader to recall those towels being in Tide. From my own family history it would make sense; my mum always bought Tide, and some of those detergent towels are still lurking in a far corner of some linen closet or other. I remember the cylinder-shaped boxes of oatmeal (Quaker Oats, right?) but don’t recall dishes in them. Interesting! Seems like there were encyclopedia sets that you could get one book per product purchase. Oh yea, the grocery stores chimmineys used to smoke too. Hi Hadley – that encyclopedia thing rings a bell with me. I kind of think my grandparents ended up with a set of encyclopedias thanks to supermarket purchases back in the late 1960s/early 1970s. Thank you for reminding me of that! I’m thinking they came in a box of Breeze or Bounty detergent soap – red box 196? – early 1970s. The very thin towels came in boxes of Duz and their arch competitor Breeze during the 1960. I know because I worked at Procter & Gamble which made Duz . Lots of arguments around the office about the floral design printed on the towels. Lol. Roy, I would give anything to have been a fly on the wall during those arguments! I swear, you need to write a book! (Or at least send some stories to me so I can share them. Never hesitate to email me: sedgwick.katherine@gmail.com.) Being at a company like Procter & Gamble during the Mad Men years must have been an absolute blast! Yes, it was the Mad Men era but there was no drinking and less cavorting at P&G. It did happen at the agencies however. A couple of years later I was working elsewhere and again it was time to go to New York to an ad agency. We had a good early meeting, had lunch with the agency people and were free for the rest of the day as we had booked an 8PM flight home. My assistant knew a good steakhouse that had a great outdoor bar so we went over there. The place was empty but we ordered drinks and carried them out to the sidewalk. We could see a guy standing guard next to his car parked at the curb. The car was a few years old, maybe a Cadillac or an Oldsmobile. The only thing is that the owner had upholstered the outside of the car with brown vinyl in an alligator pattern. Pretty unusual. The owner told us how proud he was if it. It was early summer and the weather was gorgeous. Suddenly I looked up and spotted a couple I recognized about a block away walking toward us. It was Joanne Woodward and Paul Newman at the peak of their stardom. I ran up to them and mentioned the car knowing Paul had a great interest in cars. They did look at the car and they were amused. We invited them into the bar for a glass of wine but then left them alone. Oh man, Roy – AMAZING story! Thank you!! Hi Ken! Happy to find yet another person who remembers those towels in detergent boxes. Funny – when I think of Bounty, it’s paper towels that come to mind (remember the ads with Nancy Walker?) and not detergent. But it seems there were a bazillion different detergent brands back in those days, and I imagine there might very well have been one named Bounty. Hi Katherine I remember the dishes with roses on them, the glasses with different seasons and leaves, birds in tea. Now on a different note, you mansion Haliburton County…..are you from that area??? My husband grew up in Gelert and Lochlin. Hi Donna! I am indeed originally from Haliburton County – born in Minden, and the Sedgwick family farm is at Gelert. I certainly recognize your last name as being from that area! I wonder if your husband is old enough to remember the general store at Lochlin (or even the one at Gelert). I have happy memories of those places! Wow, Shari, that’s a detergent I’d never heard of! But I looked it up and found this article from the Los Angeles Times, which tells me that it was produced in Los Angeles. The story says it was found in 22 states, but I don’t think White King D ever made it up here to Canada. The history of the company as related in the Times story is pretty interesting – apparently White King D was the very first powdered laundry soap. Thank you for putting me on to this! Towels came in Bonus…i remember mamma pulling them out.